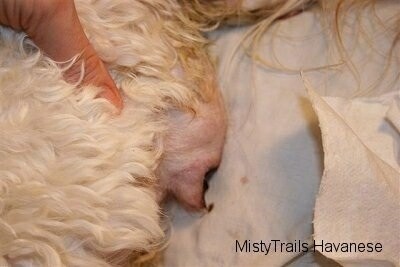 Dewclaws should be removed within 20 minutes of birth or by day five at the latest. Call your vet. I do mine myself right at birth. The extra scream from the puppy cleans it out too. 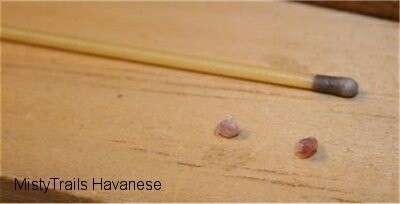 I use sterile small hemostats. PLEASE do not try this on your own if you have never done it as it is a job that requires experience. You do NOT cut it off or it will bleed. You need hemostats and a nitro stick to stop the bleeding. You also do not take just the nail, or claw…you need the whole thumb. You cannot PULL it off without knowing what you are doing because you do not want to pull the tendons out of the puppy’s foot. So PLEASE, just because I do this at birth, do NOT do it unless you know exactly what you are doing. This is considered a vet's job. 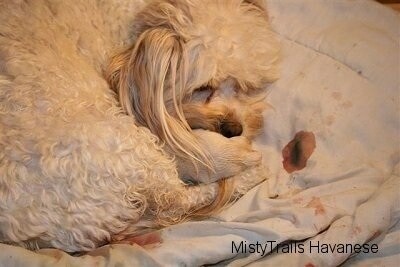 But experienced breeders have learned to do this, and to dock tails if their breed requires. In this picture, the dewclaws are gone. The discarded dewclaws and the stick you use to stop any bleeding. 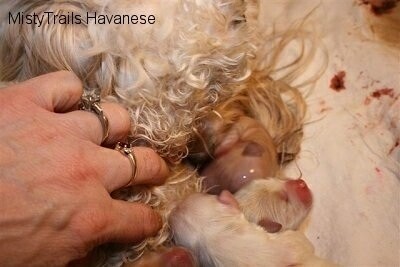 The second puppy is in the birth canal. 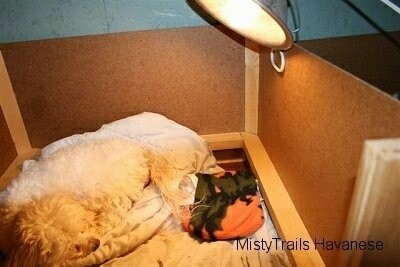 The first puppy is put back in a warm wrap near the dam while she works on the second puppy. She pushed this one out on her own at 2 a.m. (20 minutes after the first pup). A little smaller at 224 g (7.8 oz. ), this one will be called "Yellow Boy." 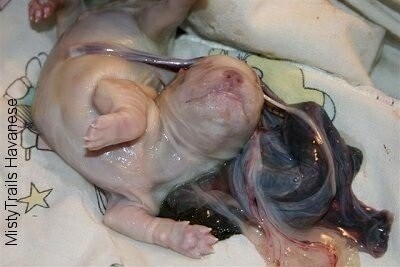 He came out with his placenta. I get the sac off of his face. And suction him with the blue bulb. I give him to Mom, and WOW, she is a natural. 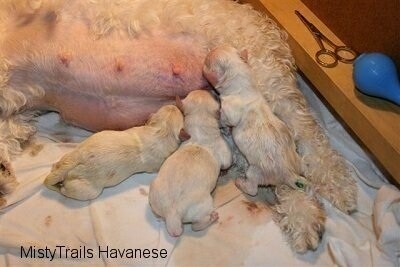 This is her first litter, and she is a 100% awesome mommy cleaning them. This does not always happen, see links below…. 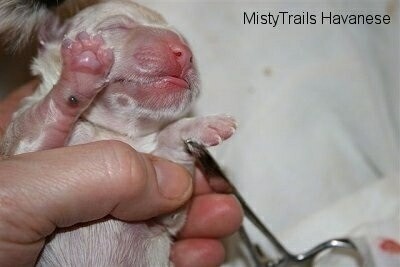 This whelping is pretty textbook, but this is not always the case. I get the pups on suckling between puppies. 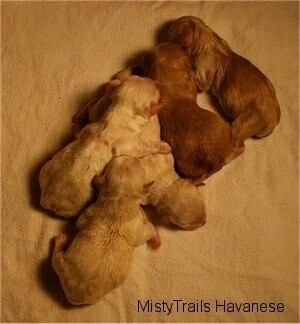 The third puppy is coming. 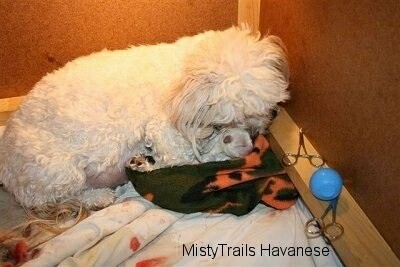 I put the first two pups in a warm area…sometimes MOMMY wants in there too (LOL). Just keep moving them out of her way, but keep them in her sight. I let her push him the rest of the way; there is NO rush to intervene at this time. OKAY, he is out. Notice he is in a sac. Some breeders let their dams break the sac. I take it off NOW, fast... It's the first thing I do, as once they are out they are ready for the first breaths. 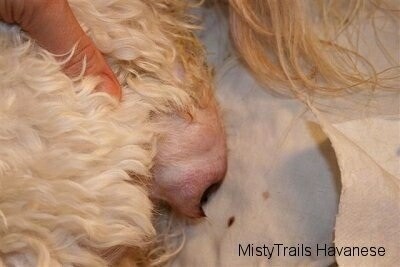 GRAB the sac, pinch it, pull it away from the puppy's face, and RIP it off as if you were biting it off. Get it GONE. OK, sac is off, but this pup still needs to breathe. He isn't blue, but he is a little white; we need to pink him up. 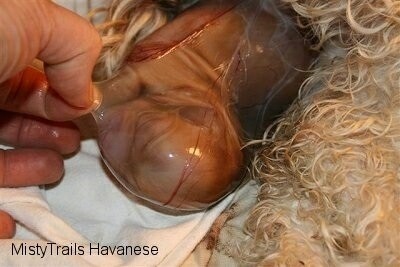 Notice the placenta came out with this puppy. KEEP COUNT of your placentas. 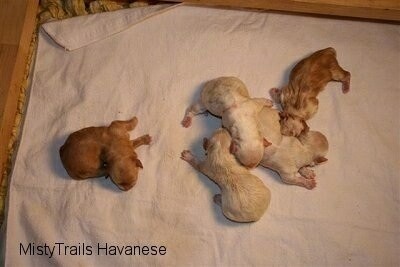 You need ONE out for each puppy...KEEP TRACK! 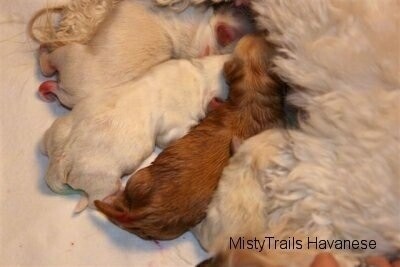 Three pups out, two more to go... I let them nurse. Offer the dam nice cold fresh water. Give it to her inside her box. She will not come out for it. 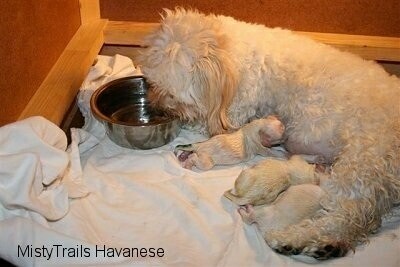 So, the pups were born at 1:40 a.m., 2:00 a.m. and 2:20 a.m. For my breed (Havanese), I like to see pups every half hour. At 3:20 a.m. (one hour later) I see a small contraction and I give the dam 1cc of calcium. At 3:30 a.m. there is a gush of water (my guess is that the second horn is now ready to deliver). 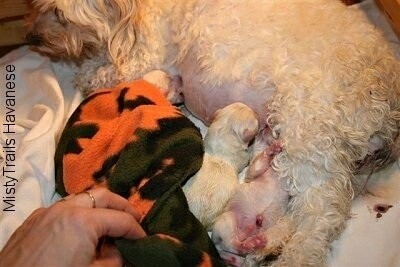 An hour later, pup #4 is coming (first three pups are put aside in the warm cloth). 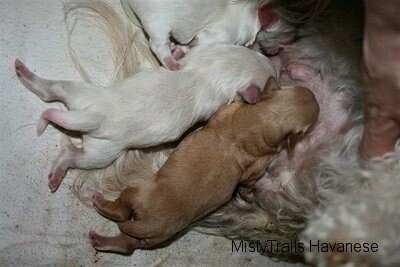 Pup number four is presenting a head. The head and shoulders are out. The dam is doing well and I am standing back, letting her do her thing. 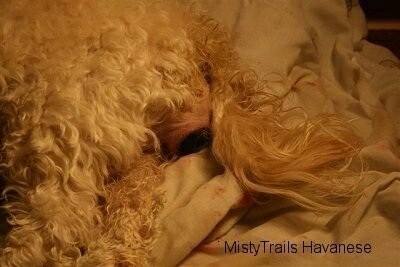 If I suspected that she needed help to get this pup out, or if it was stuck, I would remove the sac. 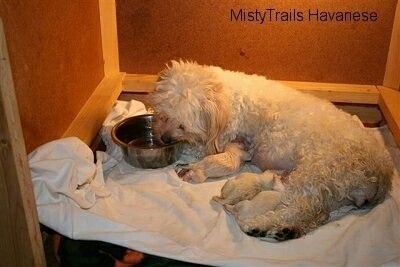 But she is doing WELL, and I will let her work on getting the pup out first. 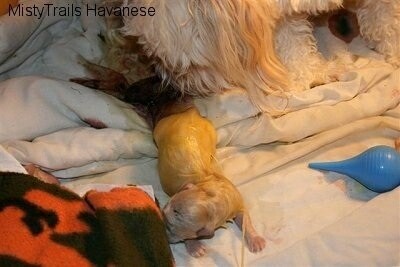 At 3:35 a.m. a GORGEOUS golden red girl is born weighing 234 g (8.2 oz.). She is big! It is common for the first puppy out of each horn to be the biggest, as they get the bigger veins for nutrition, while the last ones in the horn tend to be smaller. At 3:50 a.m., I give the dam 1cc of calcium. 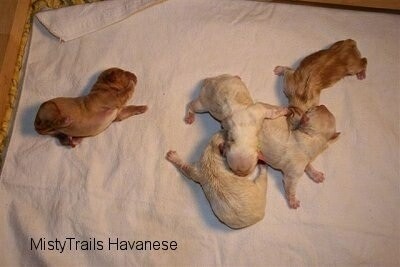 Last puppy just came out without warning. One push at 4:00 a.m. This pup will be called "Blue Boy," weighing 202 g (7 oz). Placenta was retained...but I have a hold of it. 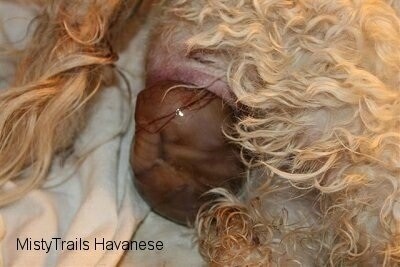 It is very important to me to not have a retained placenta, if I can help it. 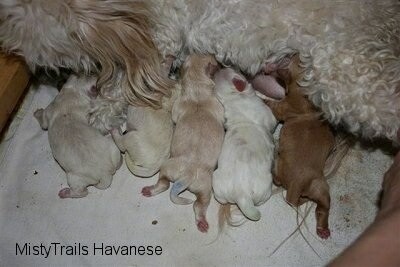 Five thriving pups under the heat lamp. Get mom cleaned up a bit, and offer some more water or broth. 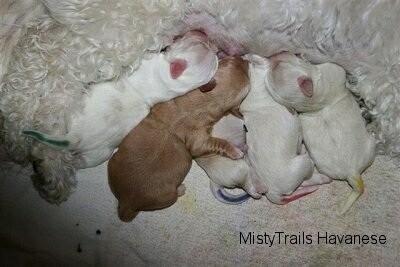 One-day-old pups—each pup is color-coded, as these four males are pretty similar and you need to keep track of each one for daily progress.